Now the Lurgan Blues face a derby date with Dungannon Swifts determined to switch focus from league frustrations and add another chapter to the club’s proud knockout history. Kris Lindsay lifts the Irish Cup as Glenavon captain. Pic by PressEye Ltd.
Hamilton has guided Glenavon to the domestic game’s most prized knockout reward on two occasions and will go up against a Swifts side managed by Kris Lindsay, the latter such a familiar figure for so much of that Irish Cup progress. Glenavon’s weekend draw at Cliftonville offered a step back towards the early-season form which left the side flying high in the Danske Bank Premiership - but the away-day point also served to extend a search for league success to seven outings. 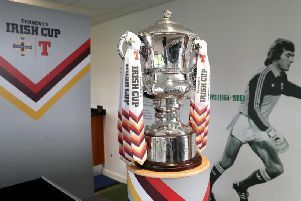 “We have always been realistic about the club and how cups offer our most realistic chance of silverware,” said Hamilton. “We have been able to show in past games how we can beat anyone and go into the tie aware it is a one-off game so self-belief will be vital. “But I felt last weekend we looked closer to matching the standards set earlier in the season, in terms of that hunger, desire and energy. “The only frustration came with lacking that killer instinct but we basically dominated for a full 45 minutes and also looked strong defensively. 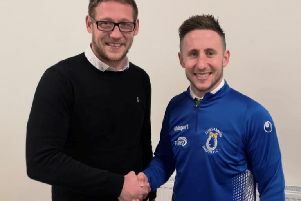 Glenavon’s cup preparations have taken place this week alongside a squad reshuffle following Steo Donnelly’s departure and the capture of Eoin Wearen. “We wish Steo every success in the future and did not want to stand in his way when he was unhappy,” said Hamilton. “He has returned to Usher Celtic and we hope everything works out as Steo is a great guy. “Eoin is a player who was tipped a few years back to go across the water before he suffered a cruciate injury. Aside from the links with Lindsay, one on-the-field familiar threat for Glenavon could prove in-form Lurgan-born Oisin Smyth. The Swifts teenager grabbed the winning goal last weekend against Coleraine for a second strike in three appearances. “Oisin has come in here and there since I have taken over,” said Lindsay. “He has got his opportunity over the last few weeks and he has grasped it with both hands. “He’s only 18, but technically he’s excellent, he keeps the ball really well, and physically he doesn’t struggle, he’s a big lad, he can put himself about as well and he can score. “We hit Coleraine on the break on numerous occasions and Oisin scored a great goal. “I know how difficult it will be going to Mourneview, Glenavon have quality players in their dressing room. “Yes, everyone is talking about Mark Sykes and Ben Doherty leaving, but there is still plenty of quality all over the pitch. “We know it will be difficult, but we go there full of confidence. “It’s a cup game and you have to go and give it a rattle.